For those of us who played through the many installments of the Assassin’s Creed franchise, how often have we lamented that we wish to interact more with the environment, help more people, be able to explore more of the beautiful world and collect great stuff along the way? We should always be careful of what we wish for. In the massive open world of Assassin’s Creed Origins (AC Origins), there is just so much to do, so many people to help and so many items to collect that it is tempting to let the main quest fall by the wayside. AC Origins is set in ancient Egypt around 50 BC, when Cleopatra was deposed as the queen while her brother, Ptolemy XIII, was ruling Egypt. During that time, the people were suffering under Ptolemy’s rule, with bandits running rampant and food scarce. 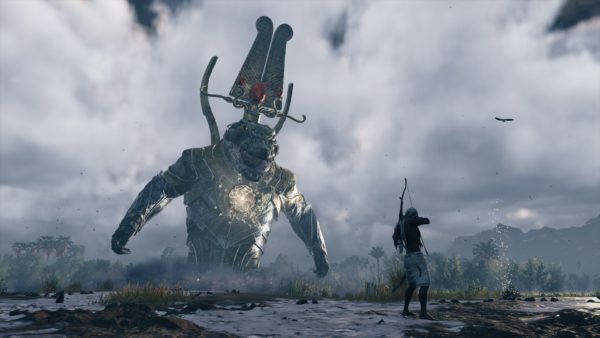 When we first meet Bayek, the protagonist in AC Origins, he has just dispatched one of the members of The Order of the Ancients, a shadowy group who had earlier threatened Bayek and caused the death of Bayek’s son. Since then, Bayek had been consumed by his thirst for vengeance and sought to assassinate all those responsible. It was later revealed that it was the Order who had placed Ptolemy XIII as a puppet pharaoh and were manipulating him from the shadows. 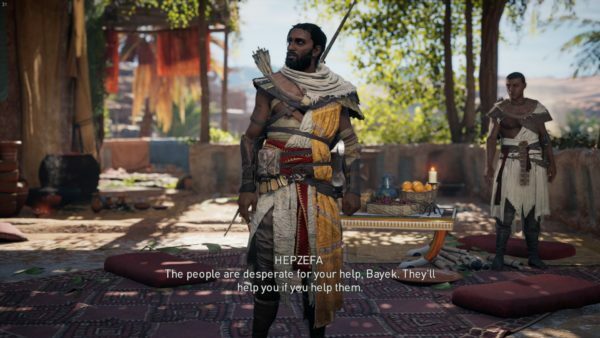 Bayek and his wife, Aya, sought vengeance and began their quest to destroy the Order, overthrow the current ruler while joining Cleopatra’s cause to reinstate her. Prior to the tragedy, Bayek was a Medjay – the defender of the pharaoh (kind of like a Kingsguard) – and everyone still refers to him as such, constantly asking him for help and making you, the player, extremely busy. When he’s not on his bloodthirsty quest, or mourning the loss of his son, Bayek is a pretty chill guy with an easy smile and friendly demeanor. 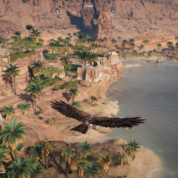 He also has a pet eagle, Senu, who serves as a drone to help Bayek survey the area, mark out potential hazards, identify targets, and even help harass enemies. 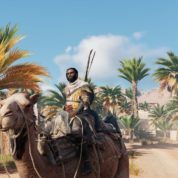 Another pet is a camel that Bayek can ride around on. It can be upgraded to a horse for speedier travel in the vast world of AC Origins. In the modern world, it is Abstergo researcher, Layla Hassan, who is using a portable version of the Animus to experience Bayek’s (and later Aya’s) memories. As she delves deeper into what unfolded in the past, she goes against her superior’s orders, pushes the boundaries of Abstergo protocol too far and finds herself in mortal danger. AC Origins has included elements from other game genres that might appeal to gamers who enjoy open world and role-playing games (RPG). 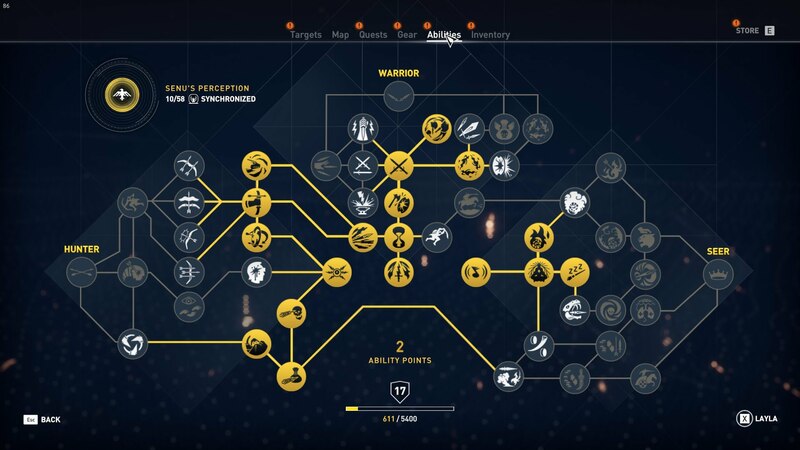 An extensive skill tree lets Bayek specialise to become a Hunter, Warrior or Seer, depending on how you prefer to play the game. This also gives you incentive to complete quests and gain Experience Points (XP) to unlock new abilities that give you an edge in the game. The game also has a crafting element, which lets you hunt wild animals for their leather, loot enemy camps or waylay transport convoys for wood and metal. 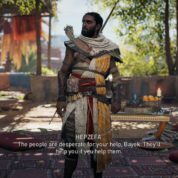 You can then upgrade Bayek’s gear such as breastplate, quiver, bracers and gloves that will aid him in defence and attack. 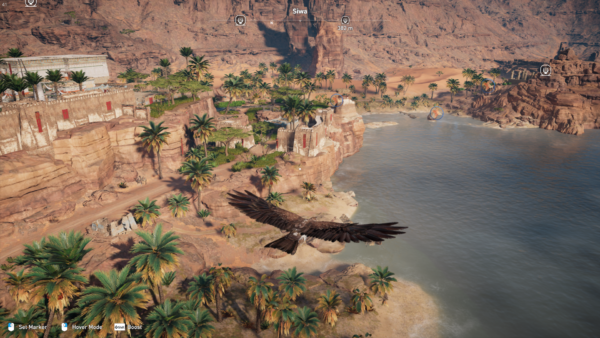 As you explore the world of AC Origins, you will encounter wild animals such as vultures, hyenas, crocodiles and even hippopotamuses who will attack you – if you defeat them, you get cool trophies as well as crafting ingredients. In case you find the main mission too intense and need a break, AC Origins has a plethora of interesting side quests, some of which are investigation-type quests where you need to examine a crime scene and solve a puzzle, rescue people held by the soldiers, sneak in some place and steal something, or retrieve things underwater. For more distractions, you can even take part in chariot races at the Hippodrome as a mini game, but the awful handling and the clumsy chariots make it a lot less fun than it sounds. 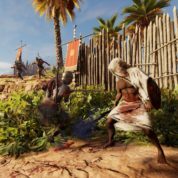 On the flip side, AC Origins has done a commendable job in tracking your objectives – it will notify you if you have an open quest nearby, and will also show you the objectives in your location, such as looting a high-level item, finding a hidden papyrus or assassinating an enemy commander. 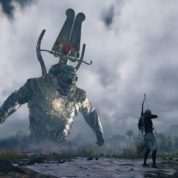 And for the completist in us looking for an excuse to explore the world, AC Origins has many opportunities for Bayek to find several collections of landmarks scattered all over the huge map, such as Ptolemy’s statues, stone circles, tombs and hermits. Inventory management is a whole new kettle of fish. Apart from crafting ingredients, Bayek’s gear and quest items, there are cryptic papyri that point you to hidden treasures, animal trophies, and pretty but useless trinkets that you can keep to admire or sell. A wide skill tree gives one purpose to level up by gaining XP, just like crafting and collecting give purpose for hunting and looting. And with a huge inventory to manage, you will need to spend time sifting through your collection, selling items to merchants or dismantling them for crafting ingredients. If that still wasn’t enough, there are also plenty of limited timed activities such as avenging a fellow gamer, or challenging a powerful opponent in the Trial of the Gods to win rare loot. Plus, there are daily quests set by Reda, the wandering merchant boy, for a chance to get a rare item every day! With so much to do, who has time for the main quest? For easily distracted people or compulsive completists, we are tempted to do everything but the main quest. Thankfully, we are not punished by this – in fact, the main missions are actually made progressively more difficult so you do have to level up to take them on. If you value time over money, you can even use real-world currency to purchase Helix credits, which can then be used to purchase time savers such as crafting items, maps that reveal all hidden items and powerful gear. Unfortunately, the game gives you only 200 Helix credits for free – after that there is no way earn credits in-game. Gone are the timed challenges or puzzles in previous AC games that you do just to earn credits. Instead, you will have to purchase Helix credits from the Store (500 Helix credits for 7 SGD), which will get you the best set of maps with some change to spare, or a fancy new costume for Bayek. I would prefer that there be an option for gamers to work towards credits for in-game items like before instead of making gamers spend real money. 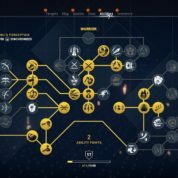 With a wide skill tree, you can actually play through AC Origins without much stealth. 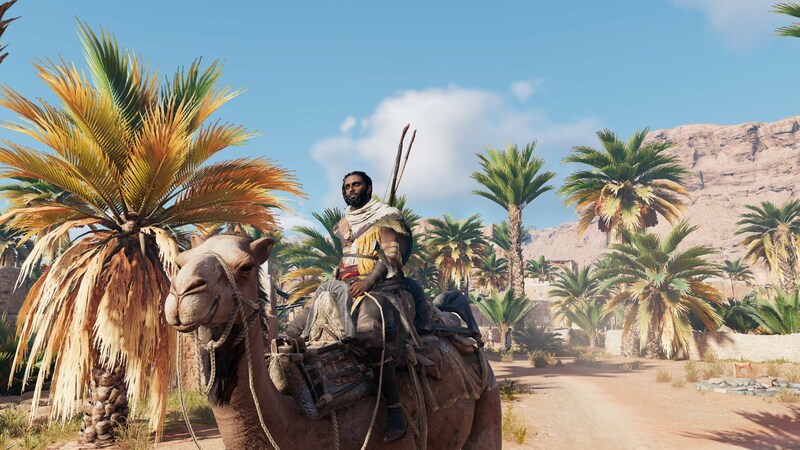 Unlike previous games, Bayek can carry and wield massive maces, shields, swords, even spears. It’s a wonder how he can carry this much and still hang off tiny crimps and jump on narrow ledges. 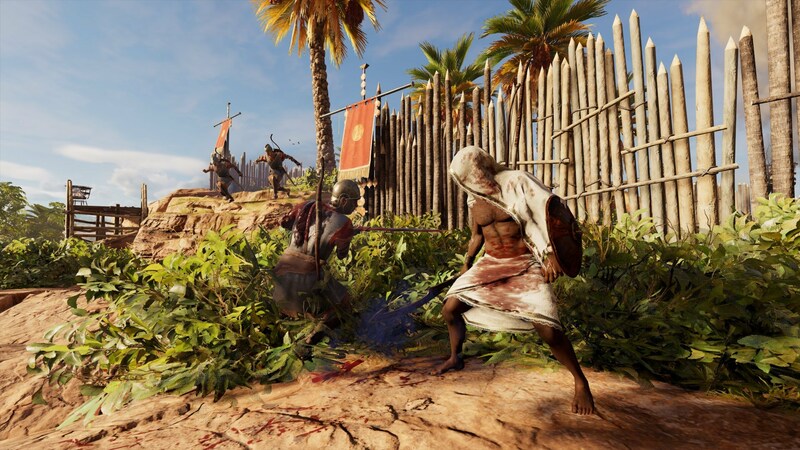 And if you are tired of sneaking around, you an upgrade Bayek’s skills so that he becomes an almost invincible warrior and you can charge into any situation with an array of weapons blazing. What I miss in AC Origins are the old tactics of blending in the crowd or sitting down to hide in plain sight. It feels like AC Origins has abandoned some of the essence of Assassin’s Creed and fallen back on the crowd-pleasing tactic of combat to get out of a sticky situation. Phylakes, who are powerful bounty hunters, and soldiers tend to attack you on sight so it’s tempting to just upgrade Bayek’s warrior skills and massacre everyone with impunity when spotted. Most missions can be completed by pure brute force, so not much stealth, sneaking or planning needed here. This can alienate loyal AC fans who prefer stealth tactics to complete missions. AC Origins is a graphically demanding game that can support up to 4K displays at a resolution of 3,840 x 2,160 pixels. Of course, this is provided you have the gaming hardware to run it. Playing AC Origins on a true 4K display lets you enjoy the amazing scenery in a lot more visual detail. Otherwise, it runs pretty decently on a 1080p HDTV, and still looks darned beautiful. With impressively rendered exotic scenery of ancient Egypt, AC Origins is a game ideal for the virtual tourist. The lighting of the game is quite amazing, with gorgeous day and night cycles and water that flows and sparkles under the blazing Egyptian sun, or the moonlight on a clear evening. An added bonus is the game’s photo mode with a multitude of camera angles and filters lets Bayek take a perfect selfie. AC Origins is daringly different from the previous titles in the Assassin’s Creed franchise, adding elements from RPG, action and open world games, favouring combat while reducing stealth and puzzle solving challenges, which I felt is a pity. Thankfully, the strong story, engaging missions and interesting characters set in an exotic world rendered in stunning graphics carries the game through. Just try not to be too hung up about the need for stealth. The Standard Edition of Assassin’s Creed Origins is available for PC (S$69.99), PlayStation 4 (S$69.00) and Xbox One X (S$69.90). If you want the works, including the season pass, added Ability Points to upgrade Bayek’s skill tree, some cool gear for Bayek and full bragging rights, go for the Gold Edition for about $30 more.